What motivated you to pursue a career as an AC repair technician? The opportunity to make a more financially stable life for me and my family. What do you like about working at Efficient? It is a family-owned business. Molly and George make you feel that you’re a valued employee and not just a number. 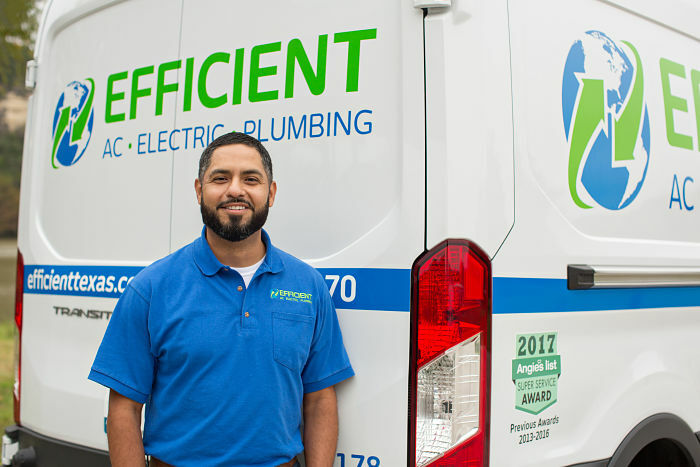 What do you like most about providing AC service? I like that it gives me the opportunity to challenge myself. Every day is a new learning experience. I also enjoy meeting new people and building relationships with customers. What do you enjoy doing when you’re not working? Spending time with my family. Wood working (small projects). Anything I can do outdoors is a BIG plus.